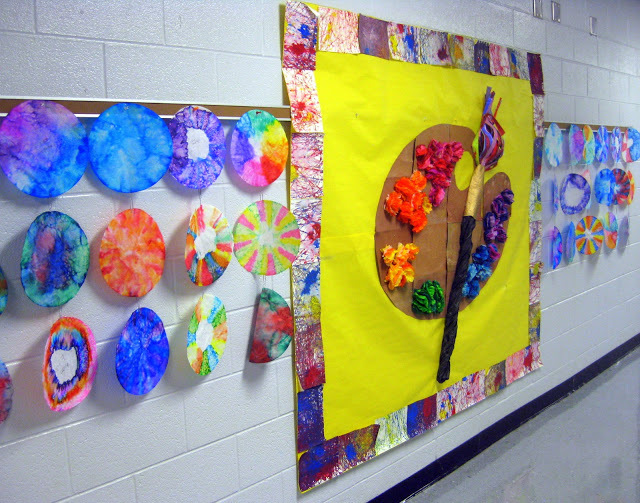 Cassie Stephens: In the Art Room: Dot Day Ideas! 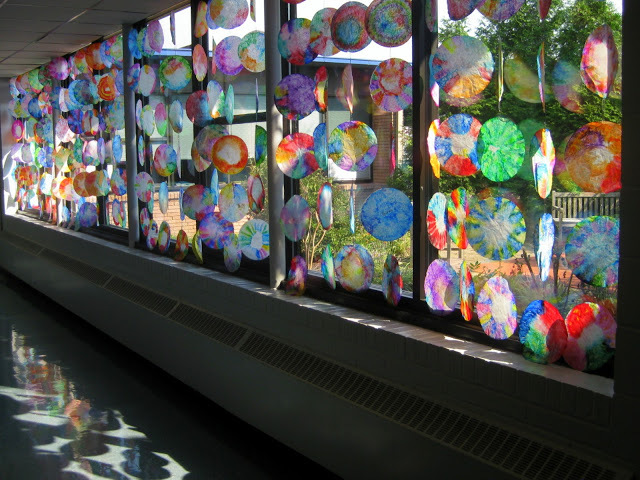 In the Art Room: Dot Day Ideas! Hey, kids! 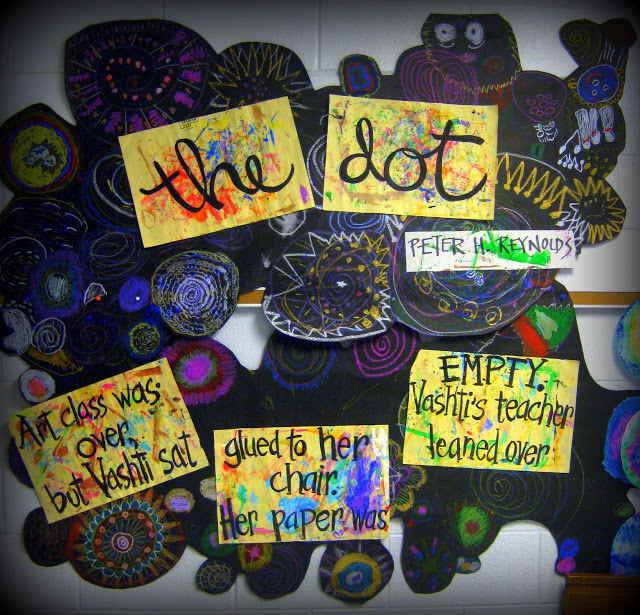 September 15th-ish is International Dot Day in the art teacherin' world. In case you aren't familiar, Dot Day is a super fab-o artsy holiday based on the book The Dot by author/illustrator Peter H. Reynolds. My young artists have celebrated Dot Day for the last couple of years and I thought I'd share their projects with you in one big ole fat blog post! It's always been a big hit with the kids and a great way to talk about what it means to be an artist. So, without further ado, let's get down to this Dot-making business! A new video created to show y'all how I teach line sculpture to kindergarten! 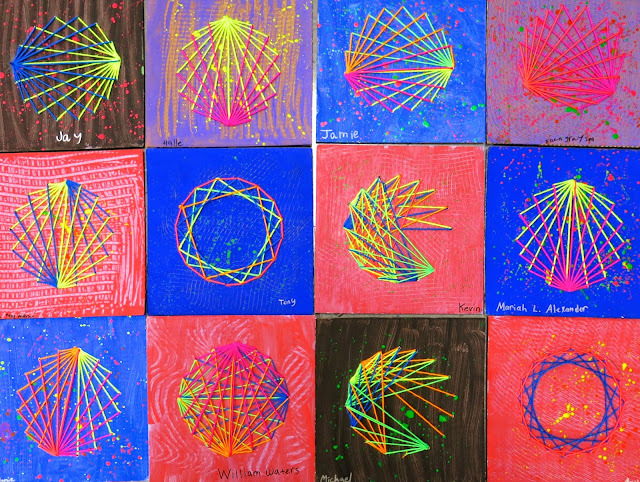 Last year, each grade level created a different type of dot. For my kindergarten friends, I stuck with my unit on line (because I love this unit so!) but added a dot-tastic twist: the base for our paper sculpture was a dot! My first grade friends created this lovely dot-inspired landscape that still hangs outside of my art room (it's about to be replaced by our current jungle-themed masterpieces...I can't wait to share that with y'all!). Each child created a dot-flower and worked on the patterned papers seen in the background. At the start of the school year, our vocabulary words were: unique, unusual, creative, artistic and fun! I think these flowers definitely qualify, don't you? Second grade artists learned all about Kandinsky who's work was on display at our local art museum. The kids created a reversible line painting on pizza rounds that I purchased via Amazon. I love hanging the kids' work in this large bank of windows we have in the hall. Do you guys do window displays? I'm always looking for more ideas so if you have any, please drop 'em in the comments! Third grade was all about the metal relief sculptures with these styro plate/aluminum foil/Sharpie numbers. They were so pretty and reflective that they seemed to catch everyone's eye. What a fun way to introduce line, shape, pattern, repetition, you name it!, to these young artists. But the biggest hit among the kids: these string stitched dots, y'all. Oh my. I can't wait to do this project again. All the kids loved it and were successful. Art teacher win! For that, watching this video and sharing it with your students might make understanding the process a lil easier. I did string art in 5th grade and I loved every minute! I was so excited to share such a fun project with my students. That were both displayed in windows and in the halls. 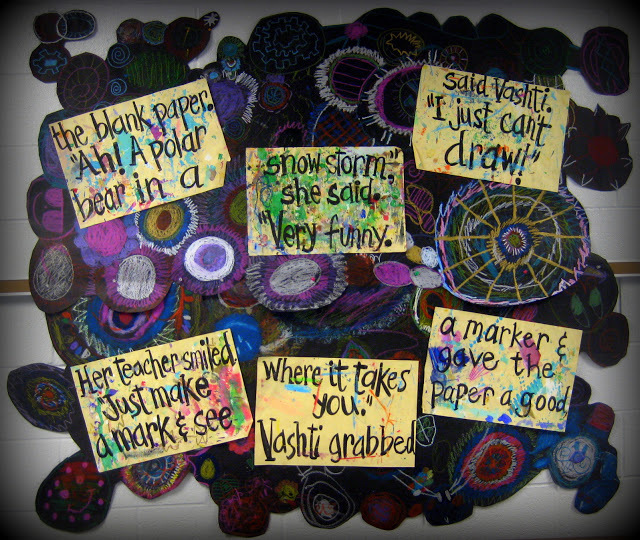 Not only that, but students created large dot collaboratives on black paper in oil pastel that served as the backdrop to the words of the book. This was a great way for me to ease back into the school year: same project, each grade level and yet a powerful effect. AND ready for open house! So! How about you? Are you celebrating Dot Day this year? I'd love to hear about what your students are creating! Wonderful stuff! You are an inspiration. What kind of foil did you use for the embossed metal! I get free pizza rounds at my school, but the white side has some kind of non stick substance so paint won't stay on it. I was going to try to use these for string art! Where do you find your patterns? Very interesting. I didn't realise The Dot was a book. I am always looking for ideas for books to buy for small children as we mostly read Dr Seuss when we started reading. Thanks for the background information. Fab penmanship on the extracts from The Dot book. And amazing projects from the children. Selina. First projects every year are for Dot Day. Love that it gives me a starting point to ease into the year. I really like the way you included the story into your display. Your videos are SOOO great!! I have started adding in sound effects and silly voices (K-4!!) and they respond so well!! Some of the 3rd and 4th graders had me as their homeroom teacher back when they were in 2nd grade and have said things like, "I wish you had done that in 2nd grade!!" Haha! Thank you so much for taking the time to make them!! A month or so ago you had responded to my comment about teaching 10 30-minute classes back to back and had offered your email address in case I had any questions. Well - with all the posts of yours I've been combing through for support/inspiration/guidance - I can't remember which post it was and so I can't find it....and of course I didn't write it down at the time - that would've made too much sense!! I have just a quick question - unrelated to Dot Day projects: What standards do you use? State? National? I'm getting zero help with this question from my district and have kind of been told to do what I think is best (i.e. we don't know). Being a regular-ed-turned-art teacher, I am struggling with a lack of direction in this area.....BAH! Found this through pinterest. I am a youth minister committed to doing artistic works once or twice a quarter because it's being removed from our schools and my youth are desperate to have a creative outlet. The ability to create is a gift of grace to be treasured! Only problem is: I'm not creative! I have wanted to do string are for ages, but the idea of nails on board was intimidating. I never considered stitching on foam board! Thank you for the wonderful inspiration! DIY: Artsy Sew Along Skirt, Completed! 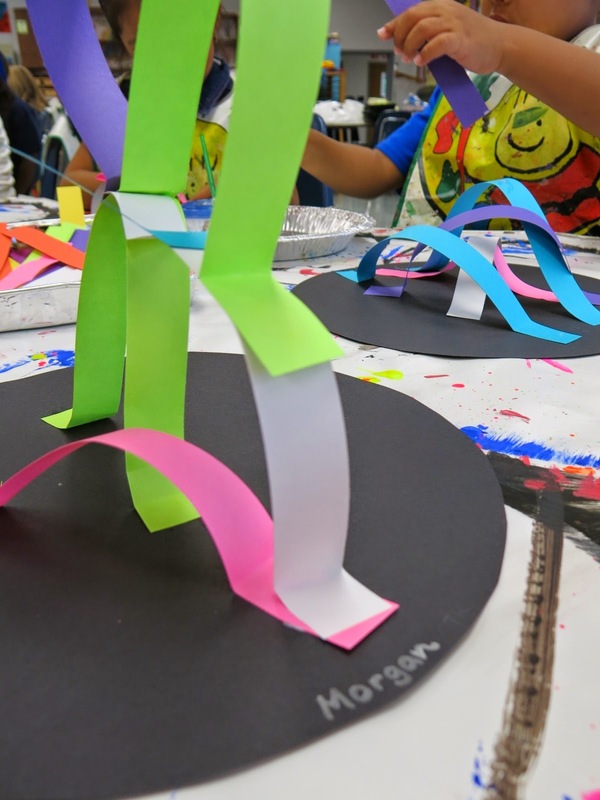 In the Art Room: First Day(s) of Art! What the Art Teacher Wore #144 and a Contest!